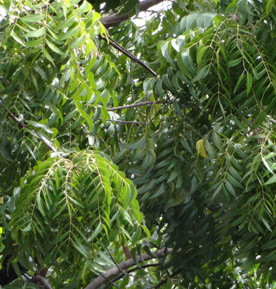 Neem Oil (azadirachtin indica) is pressed from the seed of the neem tree . This tree, native to eastern India and Burma, is known by several names including "village pharmacy," "cornucopia," "wonder tree," and "the veritable gold mine." Neem leaves, stems, seeds and oil have been used for medicinal purposes and pest control in India for more than 4,000 years. In fact, its Sanskrit name, arishta, means "reliever of sickness. In cosmetics, neem tones, nourishes and protects dry skin, keeping the skin healthy. This oil has moisturizing properties and contains Vitamin E as well as essential fatty acids. Neem oil is very useful for soothing itchy skin caused by dryness. 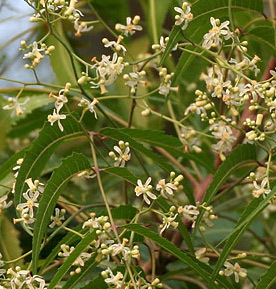 Neem tree oil is also used in salves and creams that help to soothe and protect the skin. Neem is an extraordinary ingredient in cosmetic protects, creams, lotions, soaps and is a wonderful alternative to chemicals that are so often a part of commercial mixes.